Tension headache symptoms... what are they? Tension headache symptoms are characterized by a dull, non-pulsing ache or pressure on both sides of the back of the head, above/behind the eyes, or on the sides of the head. 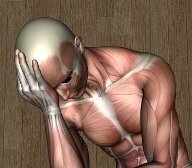 The headache sufferer will often notice tense muscles in his or her neck and shoulder, hence the name "Tension Headache". Other symptoms may include tenderness of the scalp and even loss of appetite. Here is a summary of typical tension headache versus migraine headache symptoms. It used to be thought that the cause of tension headaches was people holding their muscles tight. However, recent tests have revealed that, although there are tight muscles involved, the muscles are not actively firing. They are tight because they are full of trigger points! So, you are thinking, what does that mean for me? Fortunately, you can deactivate trigger points on your own using information from this site. These trigger points can be activated to create pain in a number of different ways, especially by dehydration. 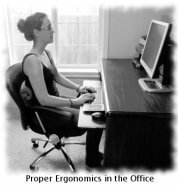 They are also stressed by poor posture and poor ergonomics. There can even be other nutritional components. And of course, there can be joints that aren't moving properly in the neck that contribute to the headaches. 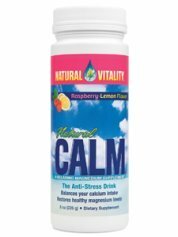 To learn how to obtain relief from your tension headache symptoms, click here.